In contrast with high-profile incidents around the country, the New Orleans Police Department has not had a single officer-involved shooting so far in 2016, prompting civil-rights activists to suggest that the sweeping reforms of the NOPD should be expanded in other communities like Baton Rouge and applied to officers from other agencies like the Louisiana State Police or Jefferson Parish Sheriff’s Office who come into the city. 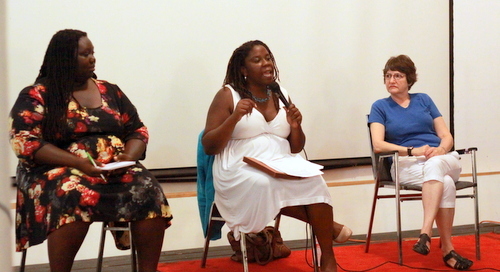 Price, Mandisa Moore-O’Neal of Black Youth Project 100 and Marjorie Esman of the state chapter of the American Civil Liberties Union spoke as part of a panel Saturday afternoon on police militarization in the state as part of the 2016 convention of the Green Party of Louisiana, held at Zeitgeist Multi-Disciplinary Arts Center on O.C. Haley Boulevard. The ACLU and the Black Youth Project 100 have filed a federal lawsuit against the Baton Rouge Police Department over its handling of the protests following the death of Alton Sterling. The panelists noted that a recent U.N. report on the Baton Rouge protests said police are “manifestly unwise” to respond to peaceful crowds with tactical units and force. By contrast, the same report praised New Orleans police for their hands-off approach to similar protests, allowing them to march and congregate without interference. The praise for New Orleans police behavior this summer contrasts with the department’s own militarization, which is what led to the death of unarmed 20-year-old Wendell Allen in Gentilly in 2012, Esman said. Police departments increasingly rely on surplus military equipment given to them for free by the U.S. government, then use it in inappropriate situations such as the search warrant on Allen’s home that turned up about five ounces of marijuana. The department still has yet to implement the procedural changes the monitor’s office recommended following the shooting, Price said. NOPD spokesman Tyler Gamble touted the implementation of body-worn cameras and new policies for in-car cameras for all officers, as well as new training in the consent decree. U.S. Judge Susie Morgan noted the Department of Justice’s commendations for the NOPD in a May hearing about the status of the federal consent decree governing the department. Based on the strides being made in New Orleans, Price said the next steps for activists should be the support of similar reforms around the region — particularly in Baton Rouge. Likewise, she said, the city government should consider extending NOPD policies to apply to officers form other jurisdictions — such as the Louisiana State Police or the Jefferson Parish Sheriff’s Office — to prevent more tragedies like the fatal shooting of Eric Harris in Central City by Jefferson deputies who chased him into the city limits while Mardi Gras parades rolled. Only cities with citizens who are out of their right minds would want a police department emulating the NOPD. The NOPD has so few patrols it could not stop record teenager robberies and carjackings this year. It has so few patrols that the murder rate remains one of the highest in the country, It has so few patrols that graffiti writers have all the time they need to paint their trash on entire walls of buildings without police interruption. It has a hot pursuit policy that is so complicated it loses the opportunity of pursuit by virtually requiring time to involve a debating team to decide whether a pursuit should even be undertaken. And on top of all this there is probably a “Ferguson Effect” where police are prone to less vigorous enforcement in situations that might lead to backlash against police. And Esman, don’t act so naive. A battering ram is hardly sophisticated military surplus equipment intended only for use in war. It is used in no-knock warrants and when suspects will not answer the door on announced warrants. Cop killers don’t exist in a vacuum. They require some sort of “intellectual” justification extreme enough to push them to murder. Cop killers must be convinced that they are the good guys, and police are the bad guys. Who is doing the convincing?